The Fresh Fork Market season has started! That means we’re getting all sorts of delicious, fresh vegetables and cheeses… which also means we have to figure out what to do with them. An entire cabbage, shredded, is too much for just coleslaw, so I went looking for another dish to make. I came across this recipe for Crispy Black Bean Tacos with Feta Cheese from Epicurious. Since we also had black beans and green onions from Fresh Fork, it seemed like a no-brainer. I went for a salad rather than a taco since salads are way easier to eat at work. I’m very pleased with how it turned out – not only delicious, but also very filling! 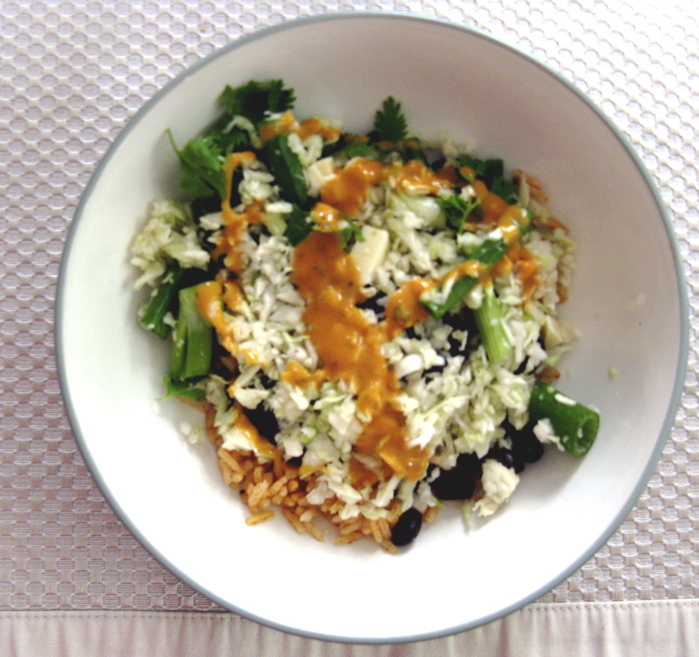 Once the black beans and rice are cooked, and everything else is cut/shredded – mix and enjoy! This entry was posted in Fresh Fork, Recipe, Salad and tagged black beans and rice, cabbage salad, Fresh Fork Market.